I found this image on Pinterest. Apparently the armour belonged to Don Sancho d'Avila and was manufactured c1560. Note the non-heraldic decoration. Don Sancho seems to have relied on his surcoat for identification (plus no doubt a standard). He spent most of his life in the Spanish Netherlands, an area not, as far as I know, home to many round shields/targes. Perhaps he wanted to be reminded of the Spanish light horse who seem to have favoured the targe. I could have been the type of jousting he was doing. It could have been the type of jousting he was doing. By the mid-16th century jousting armour had become extremely specialised and very heavy. The leg half of the armour was often integrated into the horse-armour, the jouster sitting in a sort of armoured turret. The two versions of the joust in vogue were "stechzeug" and "rennzeug". In the first the aim was to detach the opponent's crest, which meant aiming at the head. So the helmet was particularly heavy (which d'Avila's is not). In the second the target was the shield, which was attached to the body-armour and sprung to detach on being struck by the opponent's lance. D'Avila's armour seems designed for ease of movement rather than for jousting, certainly not either of the forms described above. It is perhaps interesting to note that his accoutrements include an alternative helmet, a "burgonet" (on the floor). By mid-century the burgonet was becoming more common that the closed helm, which was very tiring when worn closed for any length of time. The closed helm had been a valuable aid against the arrow-storm, but by 1560 archery was well on the way to being replaced by shot. Burgonets were more comfortable and offered their users better vision on increasingly smoky battlefields, and were particularly useful for senior commanders who needed to see and to be able to issue orders without having to raise and lower their visors each time. In 1560 many of d'Avila's cavalry would already have been following the English innovation of discarding their leg-armour and relying instead on stout leather boots, giving rise to the transitional phase between men-at-arms and cavalry known as the "demi-lancer". Sancho d'Avila hadn't taken this step when he ordered his new suit of armour in 1560, but it was only a matter of a few years before mounted officers and heavy horse were equipped far more like the British Household Cavalry we can see on parade in London today, while traditional suits of armour were consigned to the dusty corridors of stately homes. Mobility had become more important than protection. The only exception to this trend was jousting, where heavy, unwieldy, armour was acceptable in the controlled environs of the lists, where staff were on hand to assist with mounting and dismounting. You would have to discuss that theory with the museum! Re-reading Sir Charles Oman's "A History of the Art of War in the Sixteenth Century" (Greenhill Books. ISBN 978-0-947898-69-4), in particular the chapters on the halberdiers and pikemen of the Swiss Confederacy, I was struck by the reference to their dominance being overcome by the Spanish "sword and buckler men". These soldiers, properly known as rodeleros were well-armoured and equipped, as you may already have guessed, with sword and buckler. Don Sancho's armour is thus nothing else but a Rolls-Royce version of the equipment of a rodelero. 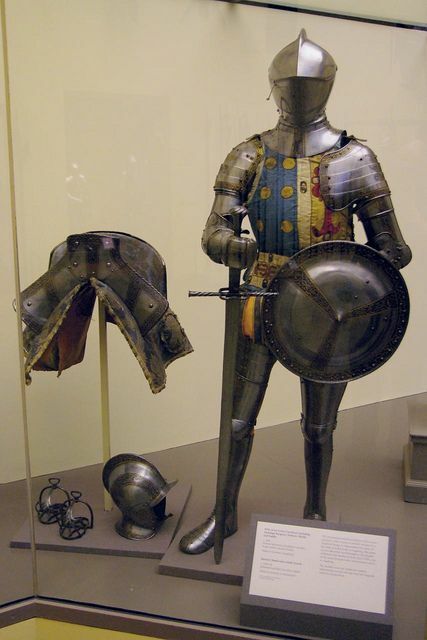 If there is any mystery to it, it is that by 1560, which is when this armour was allegedly manufactured, the rodelero had already been phased out of the Spanish army a generation earlier. So one may guess that Don Sancho's armour was made purely for parade purposes, rather in the same way as modern parade uniforms are a throw-back to the battle uniforms of former times.